3-dimensional sequin flowers made their debut in the 1960’s and have adorned countless haute couture fashion looks since. You can add them to customise dance costumes, bridal gowns, formal dresses, evening wear, children’s wear & millinery. And once learned correctly they are an effective way to adorn garments quickly. In this class you will create a beaded purse. 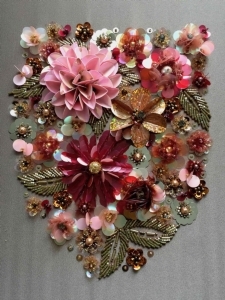 Using a needle, you will create flowers in all shapes, sizes and configurations of sequins, crystals and beads. Design & mark making details, Stacking, folding, taping, colour gradation will give you a rich and couture result.